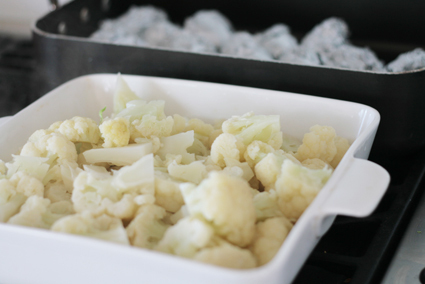 Heat the oven to 200CRemove the green outer leaves from the cauliflower and steam whole over a pan of boiling water for 10 minutes. 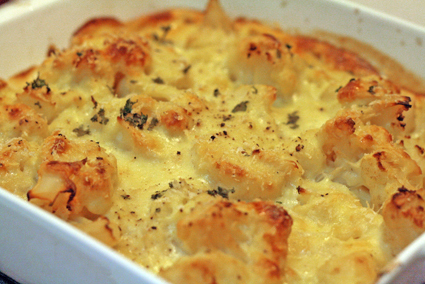 Remove the cauliflower from the heat and leave to cool. Turn the heat up to medium and add the milk in one go and whisk furiously until all a smooth sauce is formed. Continue stirring until the sauce is thickened and glossy (about 5 minutes) If the sauce is very thick add a little more milk, the sauce should be thick but still runny. Add the grated cheese and stir until melted. Remove from the heat. Break the cauliflower florets from the thick, central stalk taking care not to break it into tiny pieces. Place the florets in a baking dish large enough to hold all the florets in one layer. 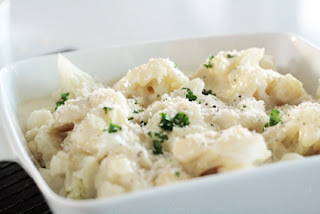 Pour the thickened cheeee sauce over the cauliflower ensuring all the florets are covered. Sprinkle with grated cheese breadcrumbs, Parmesan, parsley and a good twist of black pepper.